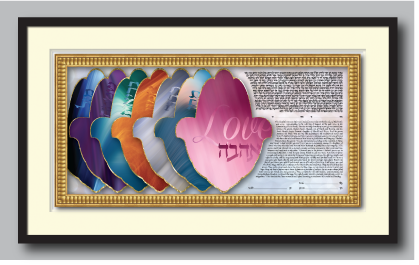 The “Chamsa Blessings” ketubah depicts a series of 7 layered hands, each containing swirling color and an emerging Hebrew word. 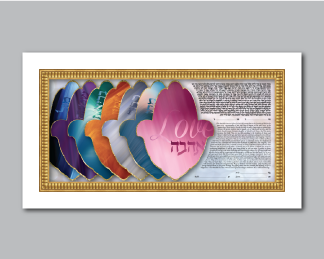 In Judaism, the number 7 is considered one of the greatest power numbers, as it represents Creation, good fortune and blessings. 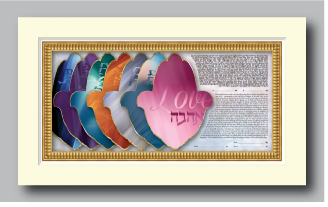 In addition, the “Chamsa” has, for thousands of years, been seen as a symbol of the “Hand of G-d”, luck and protection from the evil eye. 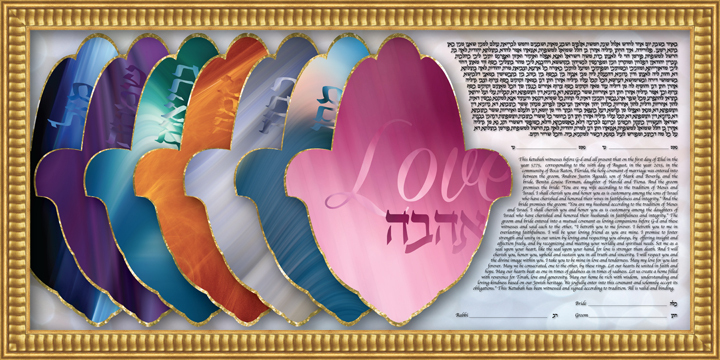 In each Chamsa, a blessings is bestowed on the betrothed couple: “Mazel - Luck”, “Simcha - Joy”, “Briyut - Health”, “Aymun - Trust”, “Kavod - Respect”, “Maton - Giving” and most importantly, “Ahava - Love”. Each hand showers its divine power over the couple joining them together in a loving, happy, healthy, joyous marriage that will last a lifetime.